Over the years, the same musical was billed as "Beware The Eyes Of Mars" and also as "Alienated" but the reviews are of the same stage show. 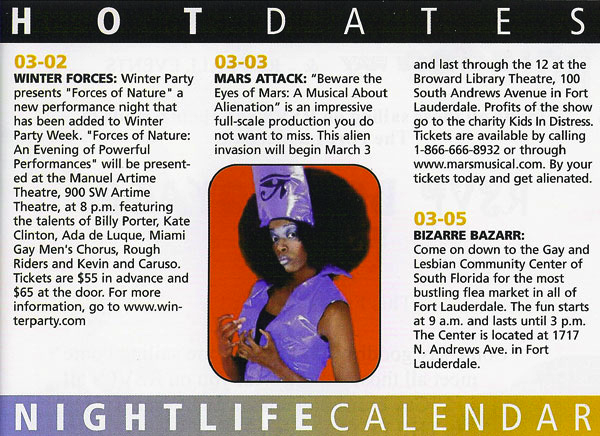 "An impressive full-scale production...an assortment of colorful extraterrestrials...Do not miss the alien invasion!" Then you’ll fit right in!" "A fun-filled production...wonderful music, catchy tunes!" "Capt. Mars and the Triplets worth seeing..."
"The final Saturday was everything you want a play to be...The lights were perfect, the acting perfect, the audience laughed at everything and clapped at every number..."
Interviews with Liza Trainer & Rachel Galvin. RADIO X INTERVIEW (2/21/06) PODCAST COMING SOON! Radio X, college radio station for Broward Community and Nova University. Listen to a half hour interview with David Mann (Director/Composer), Kaila Katesh Freas (Little Nikki), Kristopher Yager Hyland (Mars), as they reveal backstage secrets and sing a song from the show, live on the air! Show airs on Radio X (88.5 FM) from 7-7:30 PM. Podcast Coming Soon! 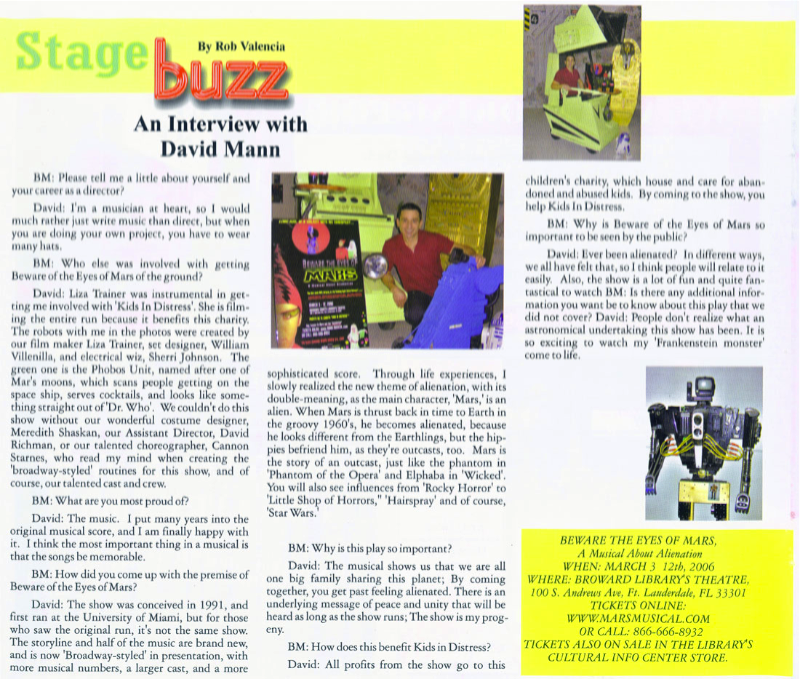 Radio X, the college radio station for Broward Community and Nova University, will be providing free spots for the auditions, as well as a full interview during November 2005 with David Mann, to discuss the show and auditions! Comcast Cable has agreed to provide us with over $6,000 worth of free local programming, reaching almost half a million South Florida Residents! They will run show dates and the audition dates as well on Channel 12. Kudos to Comcast! Feeling Alienated? Then you’ll fit right in. Join Captain Mars (Kristopher Yager Hyland) and his futuristic alien crew as their ship crashes on Earth in the groovy Sixties for the adventure of a lifetime! Mars meets a golden-haired beauty, Little Nikki (Kaila Katesh Freas), a ditzy hippie-chick to guide him along as he realizes that he is different from the earthlings. He feels socially alienated, an outcast; The audience learns with him about acceptance, unity, diversity and love. Meanwhile, Little Nikki’s nemesis, Ms. Lady Love (Latricia Mobley) has arrived. Mars realizes that he has the power to help the peaceniks and save the Earth from an alien invasion, but will he sacrifice his freedom to save the galaxy?